Mummies usually bring up visions of zombies, Hallowe'en costumes, dress-up, and the walking dead. Mummies might be creepy, but they're definitely impressive! Those Ancient Egyptians really knew what they were doing when they set out to preserve a body for eternal life. 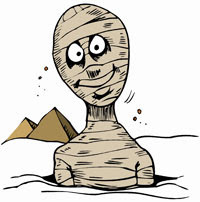 Are you a fan of Egyptian mummies? Test your knowledge with the Mummy Quiz! 1. When a body was prepared for mummification, embalmers removed the brain. How did they remove it? 2. The bodily organs were removed to prevent them from rotting inside the body. One, however was left inside. Which one was it? 5. Everyone knows Mummies were wrapped with strips of fabric. But do you know how many yards were used? 6. What sticky substance did embalmers use to secure the linen strips in place? 7. Embalmers placed four of the removed organs in special jars. What were these jars called? 8. After the mummy was all wrapped up in linen, a cloth with a picture of a god painted on it was placed over it. Which god's picture was used? 9. How many coffins were used to hold a single mummy?